My best tips for making mimosas! 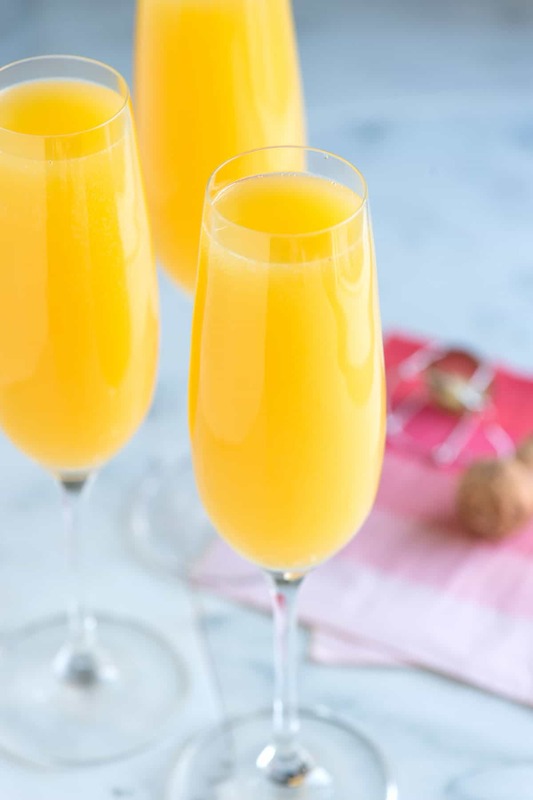 What’s better to serve at brunch than a fabulous mimosa recipe made with dry sparkling wine and orange juice? 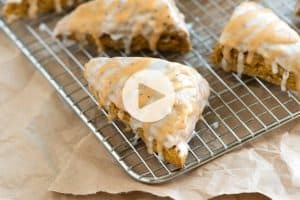 Jump to the Mimosa Recipe or watch our quick video showing you how we make them. 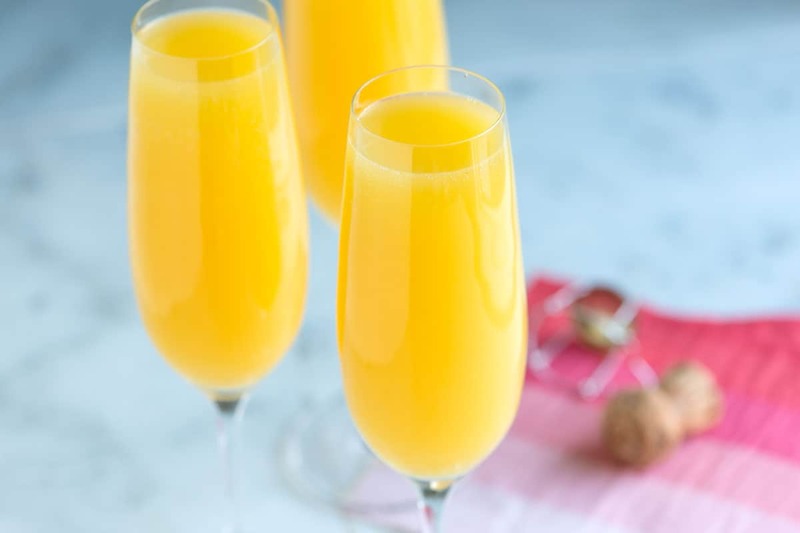 Mimosas are a delicious combination of sparking wine and orange juice. They are simple, fun and perfect to serve company. I like to use a dry sparkling wine, not sweet. Use wine that you like the taste of. You don’t need to break the bank, though. We spend $12 to $15 on the sparkling wine we add to our mimosas. Your best bet is to look for “Cava,” which comes from Spain or an American sparkling wine that’s around $15. A dry Prosecco is a great option, too. Unless you’ve found something you absolutely love, don’t go lower than $10 as that could lead to headache central. If you can swing it, use freshly squeezed orange juice. We know it seems a little over the top, but when you consider half of the drink is made from juice, you want the best. Freshly squeezed orange juice tastes more fresh, lighter, a bit tart and more delicate than anything you can find in the store. With that said, when we’re in a pinch, we’ll use the “Simply” brand of orange juice. A classic mimosa recipe calls for equal parts sparkling wine to orange juice. While we think this ratio tastes the best, if we’re serving a crowd for brunch, we do hold back the wine a little. You can obviously increase the wine, too. Just remember these will pack more of a punch. When you’re making a mimosa, always add the sparkling wine first, then top with orange juice. This way, the cocktail mixes together on its own and won’t make a sticky mess at the top of the glass. You don’t need to stir as this will cause the wine to become flat. Since sharing how we make mimosas, many of our readers have asked how to make mimosas for a crowd. You can make mimosas in a pitcher. Premix mimosas in a pitcher just before your guests arrive. Don’t do this too far in advance, because you will lose some carbonation. Whether you premix or make the mimosas one by one, make sure the wine and orange juice are well chilled. Keep the wine, orange juice, and if you added them to a pitcher, the pitcher in the refrigerator until your guests arrive. Add a splash of cranberry, pineapple or pomegranate juice. Replace some of the orange juice with blood orange or grapefruit juice. Add a tablespoon of peach or strawberry puree to the bottom of each champagne flute. Add chopped fresh fruit like strawberries, blueberries and orange slices. Add a tablespoon of liqueur like Grand Marnier or Chambord (for a French inspired mimosa). Champagne Cosmopolitan Cocktails combine the classic comso cocktail and sparkling wine. How to make a Perfect Kir Royale Cocktail with champagne and Crème de Cassis. Mimosas are perfect for brunch, birthdays, holidays, and weddings. For the best mimosa, use a dry sparkling wine, not sweet. We usually will spend $12 to $15 on the sparkling wine we add to our mimosas. Your best bet is to look for “Cava,” which comes from Spain or an American sparkling wine that’s around $15. A dry Prosecco is a great option, too. Fill 8 champagne flutes 1/2 full with chilled sparkling wine. Top with orange juice. 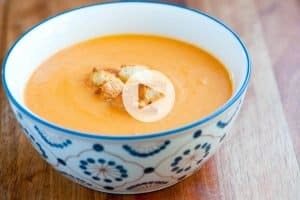 If you are using it, add 1 tablespoon of Grand Marnier to each glass. To make 1 mimosa cocktail: In a champagne flute, combine 1/3 cup chilled sparkling wine, 1/3 cup chilled orange juice and 1 tablespoon Grand Marnier or triple sec. Champagne and sparkling white wine are technically the same thing. So do not stress over which. Simply choosing more dry over sweet and sparkling are the factors to achieve a true mimosa. I did make it. It was good. For sweeter tasting wine, you could try Prosecco (which is dry, but more fruity) or if you really want it to be sweet, look for “Asti Spumante” on the label – that’s much sweeter. How about Disaronno? Would that work? Yes, the drink would be a different spin, but still tasty! I’ve always used Asti Spumante for my Mimosa. One time i did have to use the dry stuff because two stores were out of Asti. Ive now noticed that happens a lot. The dry was hard to drink. So for me I’m sticking with my Asti Spumante. I love it. If anyone hasn’t tried Asti Spumante for making your Mimosa, I totally recommend trying it. What about Tia Maria as the liqueur? Hi Kman, Tia Maria has a coffee flavor. I think something with more of a citrus flavor would work better for mimosas. For some reason I have always thought you used Champagne and orange juice. But glad to know now. Yes, me too. That’s the best way. Is it ok to use ice cubes? We prefer to used chilled juice and wine. Using ice cubes can make the mimosa watery as they melt. I read where it is not a good idea to mix these up by the pitcher; however, can you pre-make in the glasses and keep them individually refrigerated until ready to serve? Not really (bummer, I know), the bubbles of the wine will dissipate and the drink will be flat. Having a 75th birthday party. There will be about 35 to 40 guests. 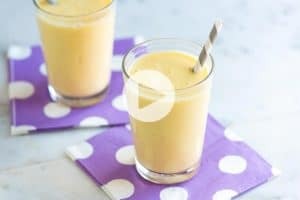 Is it fine to have pressed orange juice in a container along with white or red wine, and put it in a container in the refig? Thank you was awesome! And I have been trying to find this forever! Can I pre make a jar or mimosa so it can be ready for about 50 people? Hi Patty, we don’t recommend that you make mimosas in advance. You will loose the bubbles of the sparkling wine over time (especially if you premix in a pitcher). Would this work well in a punch bowl for a crowd? Or would that flatten the wine? Would it be wiser to serve in pitchers? That would make the mimosa flat — I would serve the OJ in pitchers and then have the sparkling wine left in the bottles with the cork removed. I need a recipe to make a memosa for 30 people for a wedding shower. Don’t like dry wines either what is a good suggestion. Look for Cava from Spain or a dry Prosecco, both work really well when it comes to mimosas. Can you use cuointreau instead of triple sec? I have not try it , yet.But looks delicious! Can I serve Mimosa in the evening? Always pour the orange juice first. The champagne is thicker and will mix down into the orange juice naturally. I use Zonin Prosecco and it is absolutely delicious. I do not like dry wine either. HI Meg, Not all sparkling wines will be the same. Next time, try asking the folks at your liquor store for advice. It sounds like you would prefer a sweeter wine. Mimosa was fantastic! Thanks for the “Cava” recommendation! Add a splash of chambord for a raspberry flavor and some color! Yum! You absolutely need the triple sec. According to the Wikipedia pages on both drinks, this isn’t actually the case. A Buck’s* Fizz is actually just 2 parts orange juice and one part sparkling wine. All the mimosa did was up the ratio to 1:1. WOW!! These look mimosas soooo good!!! And your photos are just absolutely beautiful! 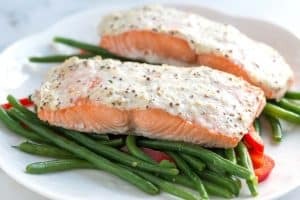 Thanks for sharing all the great tips. I must try my hand at homemade mimosas soon. Who doesn’t love a properly made Mimosa? Never thought to use a liqueur, I think I’ll try that!